Designing a catamaran in this size is a challenge if you would not end up with a floating caravan. I used our practical experience with our Pelican to design this boat. The maximum height in the central cabin is 1.48 m. I found the solution for a reasonable ergonomic by using 3 entrances. To step in the hulls, the port or star board entrance is used. The central entrance is very convenient to step in the central seating area. As shown in the drawing, there is amble seat height in the central cabin and standing height ( 1,95m ) in the hulls. The trapezoid shaped hulls have a fine entrance. The length to beam ratio of the hulls is 1 : 11. This will guarantee a fast boat (see spec. for speed prediction). The boat is relative low with good aerodynamic properties. Even with shortened sails the boat will go to windward. A factor often forgotten. There is sufficient room for four persons for extended voyages. The boat is designed in a way that even first time boat builders can build the boat without difficulties. 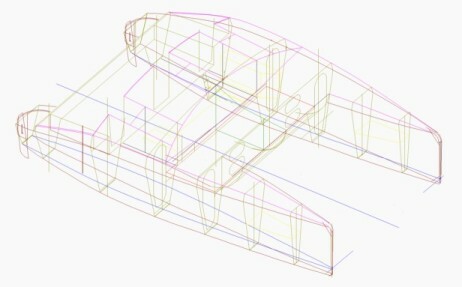 All 32 CAD drawings are to scale (1 : 1). The can be used for direct laser cutting. A 32 page description will aid you building the boat. All our 26 years of experience designing boats for amateurs is flowing into this design. We chose again plywood as basic material for availability world wide and cost efficiency.